After the joys of L’Os a Moelle and the warm glow it left behind we went to the Michelin-starred Les Fables de la Fontaine in Paris. Set in a pretty courtyard close to the Fountain near Ecole Militaire first impressions are of a quite masculine, chic eatery. Staff are very welcoming on a cold evening and forgiving of poor French. Our waiter helped interpret some of the items on the menu before we opted for the taster menu lucky dip. At €75 this is pretty comparable with most U.K. taster menus and a lower cost than going a la carte. Interestingly too there is quite a narrow wine selection all served by the glass or carafe. I don’t know if there is a mammoth bible that comes out on request but I was quite pleased at the narrower selection. I love the French and their food. Its all so intuitive and natural – like language itself. We recently visited Paris and made a trip to the little bistro L’Os a Moelle in the 15th Arrondisement. The surroundings are six- and seven-storey Haussmann apartment blocks with a little bit of commerce thrown in but most definitely mainly residential. L’Os a Moelle is a local reasonably priced eatery. By reasonably priced I mean that we paid €42 for the taster menu. As a surprise my wife bought us a visit to try the Just Imagine event at the Miele customer centre in Abingdon. We are planning a new kitchen and things have moved on a little since our last kitchen adventure – induction jobs, steam ovens, sous vide and cooking in warming drawers it seems. The event my wife had chosen was an overview of ovens, induction hobs and warming drawers. The customer centre in Abingdon is a bright airy showroom with a coffee bar and some demonstration areas upstairs. 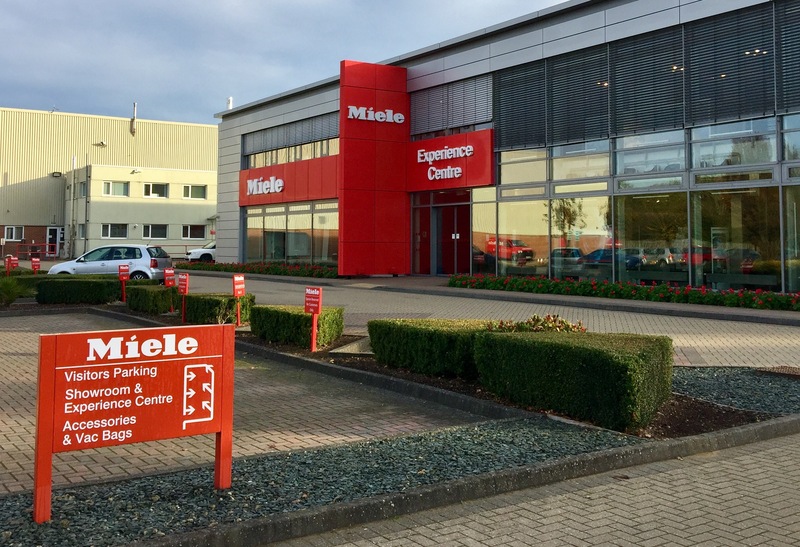 Quite honestly, if you want to know anything about Miele this is the place to come. I am a step behind that. I have a conventional oven and microwave and I want to know what I am missing. We arrive early and we received a warm welcome from the coffee bar. Needless to say all the coffee is made using the Miele machines and the barista is more than happy to show you how it all works as well as serving a delicious drink. Sometimes you can’t beat an old favourite. The weather recently took a turn and mentally I craved something a bit more autumnal rather then “summer fresh”. A recipe I keep going back to is the rather fabulous gingered puy lentils. I love lentils with their texture and earthiness. I am quite happy just to run some finely diced vegetables through them. Adding some heat and sweetness though takes them to another level. As ever, I didn’t have all the necessary ingredients so I had to improvise but it ended up well. Its nice to have a “local” restaurant – a place which you can afford to go to quite often, where the welcome is good and where the food is pretty decent too. Its a place where you can take friends and family and it still has a human side. In the past it’s tended to be a local curry house or a little Italian. In Kenilworth we have to walk past the Michelin-starred Cross to get to Harrington’s on the Hill. Don’t get me wrong, I’d love to make a regular thing of eating at the Cross but its not to everyone’s taste. Some people can feel intimidated by the fancy menus, the price and some of the ingredients. It can also be a costly business. And so we continue on with an appetite-building stroll for pre-drinks in the garden at the wonderfully set Queen And Castle overlooking the ruins of Kenilworth Castle. Its a nice start to the evening. It has delivered some of the best service and worst service in the past. There is an extensive bar with some cocktails and the essential summer Pimms (but some things are very expensive – the Coopers Sauvignon Blanc costs almost £40 a bottle here compared with £28 at the restaurant next door). We have eaten here too and enjoyed what we had but it still feels quite pub-like. I don’t claim to be anything more than a food enthusiast. I love eating good food and I attempt to cook it. There are two types of food however which rises above all the others in terms of how it makes me feel: My food, and the food of my childhood. Everyone remembers the roast chicken their Mum used to make, and the scones they had every Sunday. I’m here to remind everyone that ingredients and cuisine back then wasn’t anything exceptional. The thing about them is that you were brought up on them – they are imprinted on your brain as the best – probably because you were told and also because it was the benchmark for everything else. The newly hatched chick imprints on their mum not because its the best chicken in the world but because from that day on the nearest thing to them becomes the default Mum. My best memories of childhood food was of the recipes that came out for special occasions – a corned beef pie, Yorkshire puddings, ginger cake, date slice and pavlova. Everything else was fuel. I’ve never had much luck cooking with either pears or peaches. We struggle to get great fruit in season anyway in the UK and I’m not the most delicate of hands. There is something about fruit which makes it hard to get the flavours into them and so essentially you are left with the fruit itself as the main event. With a slightly heavy heart I adapted a Tesco recipe for peach, feta and avocado salad. Peaches looked about as good as we get – think European quality and then reduce by 20% – and so I bought some with this in mind. While on the subject of quality I think we have a 66% success rate with avocados in Britain too – I’m sick of opening another brown one! In my version of the recipe I swapped the bulgur wheat for cauliflower rice. Cauliflower rice is a bit of a faff to make compared to either couscous or bulgur wheat but it’s pretty healthy and has a lovely nutty flavour. I prepared a whole cauliflower and roasted until there was an even colour across it. The thing I like about this recipe is that it involves making a paste to stir through the rice. I blitzed lemon juice, olive oil with spinach, red chilli and spring onions along with seasoning. I didn’t have any coriander so I just added more spinach and this made a fresh but zingy base which added colour and flavour. After stirring some of this through the cauliflower until I was happy I added some shredded spinach leaves, some finely chopped red chilli and cubes of one avocado. I put slices of peach into a bowl and then sprinkled with olive oil, ground black pepper and plenty of salt before putting them on a hot griddle. This part of it actually worked really well – it softened the fruit, added to the flavour and gave a really nice colour to the dish too. The final part is to crumble some feta through and its finished. I absolutely love it but I would say its probably not a side dish unless its with something really delicate – a piece of roast white fish would go well. It would be a hit at barbecues too I think. The combination of flavours is good but the quantities and seasoning seem really important to me – enough salt from the feta against the sweetness of the peach. The photo doesn’t really do it justice; I probably shouldn’t have combined so that the golden colour of the peach with the white feta and deep green spinach. Enjoy! As a person who prefers the savoury flavours afternoon tea would not be on my bucket list of meals. As a Wedding Anniversary treat this weekend we went to The Edgbaston in Birmingham to sample their version. Its not that I haven’t had a few versions over the years. In my childhood we used to go to the Black Swan in Helmsley, North Yorkshire, as a way of appeasing my dad’s sweet tooth. I seem to remember they made the canny distinction of afternoon tea from high tea on the same menu with high tea being a slightly more savoury variation. In his later years Guy’s overlooking Scaling Dam was my father’s way of “reluctantly” eating vast quantities of home-baked cakes.